Still more questions at Liverpool! Just what is the issue at Liverpool with these nonsensical false starts ? Did all the jockeys try to start the race before the official off time of 4.15? It looked like it to me . Why was preference given to a mule of a horse in the shape of Battle Group, when his record has shown a tendency to refuse to start? I have no idea just why! With one million pounds sterling on offer surely we can do better than this? But back to the race itself , 18 finishers is a fair indication that the pace was sensible and that the good was very raceable. 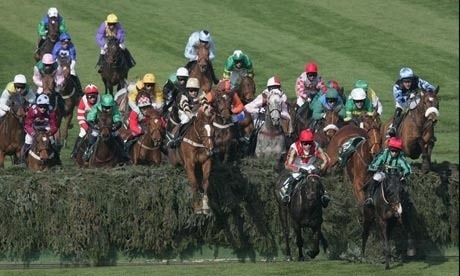 Hunt race of the year. Ridden by an Irish born jockey in the shape of Leighton Aspell who retired from race riding only to come back and win a race like this. With the horse himself only being sold to race in Britain in May of 2013, having been trained by Philip Fenton and owned by Barry Connell to win the Ulster Grand National at Downpatrick in April 2014. Its great for Downpatrick that they can sell the track as know being a proven stepping stone to Aintree success. they were selling the 2014 Grand National winner! It is such a strange game and you never truly know what way the cards will fall once you play them. Congratulations to all the connections of the winner, commiserations to his previous owners and if you ever get a chance to see the race again marvel at just how Katie Walsh stayed intact on Vesper Bell to actually complete the course. Having clouted more than one fence she worked her way into the race four fences out on the horse after some gobsmacking mistakes. If he ever gets his jumping right he could well land a major race! With another French bred big race winner in the week there progress should worry both Irish and British national hunt breeders. So the great race is over for another year, but the talking continues.